From touch to type, office to living room, from your screen to the big screen, you can see more, share more, and do more with Surface. Thin and light for easy portability, the Surface with Windows RT is productive and efficient, featuring Windows RT and Microsoft Office Home and Student 2013 RT Preview. The integrated Kickstand enables hands-free entertainment. 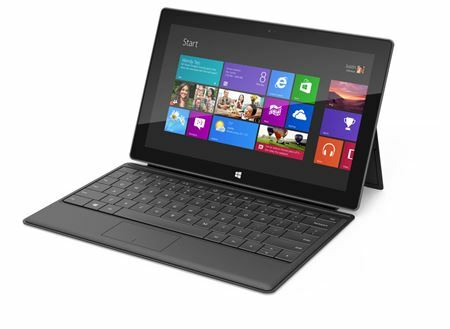 Comes with a black Touch Cover keyboard that clicks into the Surface. Clicks in to Surface offers a sleek, spill-resistant exterior for working. When folded back, it automatically disables keystrokes for a full touch-screen experience; when closed, it turns off your display. Precision crafted to be tough yet elegant, without excessive bulk. At 1.5 pounds, with a watchlike finish that's incredibly smooth, and durable, Surface is a delight to hold and touch. Provides uncompromised support and flexibility. Flip out the Kickstand for hands-free entertainment. Whether you're watching a movie, or shooting video, Surface stands on its own. Add up to 64GB of extra storage using the microSD card slot. Transfer files to and from Surface using the full-size USB port. Watch movies, show photos, or present your work on the big screen through the video out port. 802.11b/g/n wireless LAN and dual 2x2 MIMO antennas provide reliable Internet connectivity. Rear camera is angled to shoot straight ahead when the Kickstand is flipped out. The Kickstand also enables hands-free Skype video chat or recording. Easily link with other Bluetooth-enabled devices, such as a wireless keyboard, mouse and other accessories.